I always have a difficult time shopping for my husband. I want to give him something that he will use often, and that he will love. This year, I think I really nailed it with this “So Fresh and So Clean” gift basket. My husband was thrilled with it! 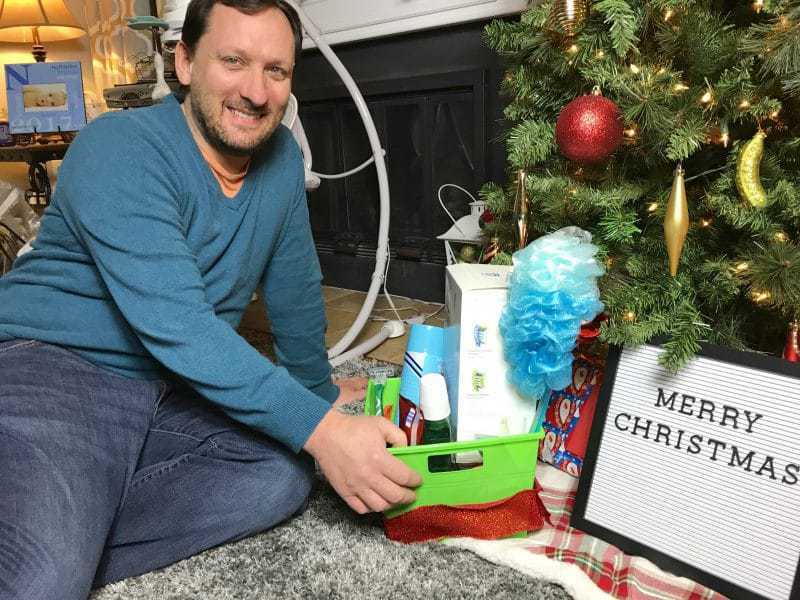 This “So Fresh and So Clean” DIY gift basket for him makes the perfect gift for all the men on your holiday shopping list. You will find ideas of items to include below, as well as tips on putting the basket together. Plus, you will find a printable “So Fresh and So Clean” gift tag at the bottom of the post that you can use to hang on your gift basket. 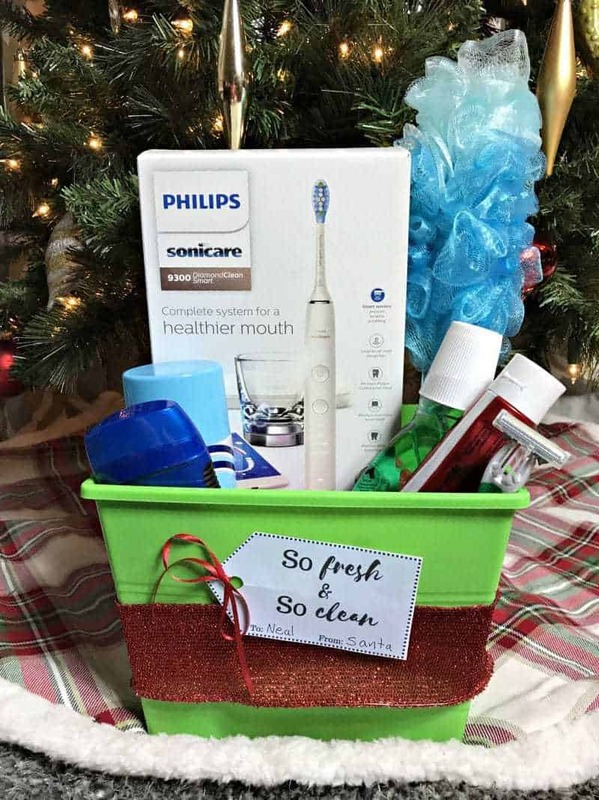 The star of the gift basket is the awesome Philips Sonicare DiamondClean Smart 9300 Rechargeable Toothbrush. Simply hover over the Philips Sonicare DiamondClean in the photo above to click through to Amazon and purchase it for your gift basket. 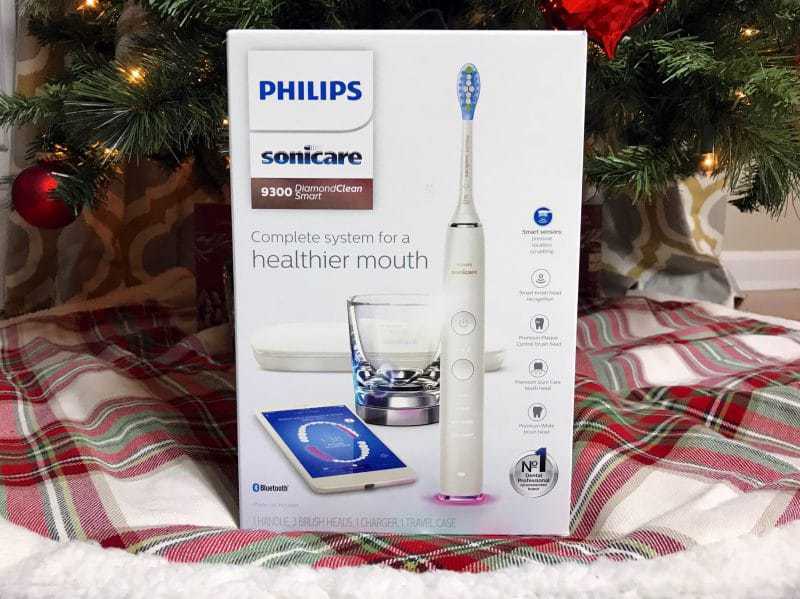 The Philips Sonicare DiamondClean 9500 Rechargeable Toothbrush was named one of Oprah’s Favorite things in 2017, and I knew that my husband would love to try a DiamondClean Smart for himself. He loves “smart” devices, especially those that pair with apps on his smartphone. 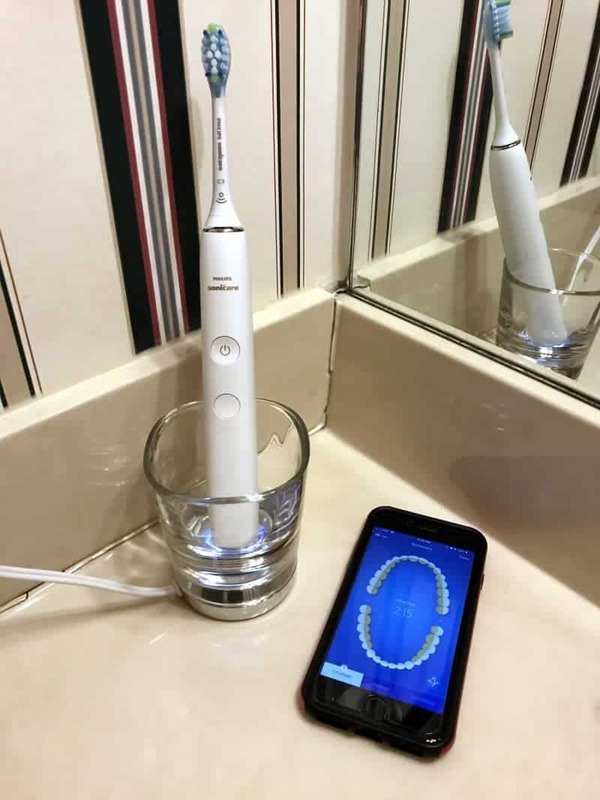 The Philips Sonicare DiamondClean uses Smart Sensor Technology to connect with the Sonicare app and deliver real-time personalized feedback and coaching to help you clean your teeth the best way possible. My husband loves how the Philips Sonicare DiamondClean times his brushing and ensures he covers all his teeth well. It even gives him tips on how to improve his brushing the next time. With its smart, high performance brush heads that automatically select the optimal mode and intensity, it is no wonder that the Philips Sonicare DiamondClean is Sonicare's best toothbrush yet. In fact, dentists recommend Philips Sonicare more than any other brand. Packed into this gift basket, along with this fantastic rechargeable toothbrush, are additional men's hygiene products that a man can use to look his best. Let's take a look at some ideas of more items to include in your “So Fresh and So Clean” DIY gift basket. If you are shopping last minute, like me, your best bet is ordering via Amazon. Not only can you find everything that you could possible need for this DIY gift basket on Amazon, but you also can't beat their shipping. With the options of 2-day or overnight shipping, you should be able to get your goodies in time for the holidays – but be sure to check the delivery date on Amazon before ordering to be certain! Once you have gathered all of your gifts, arrange them as desired in your basket. 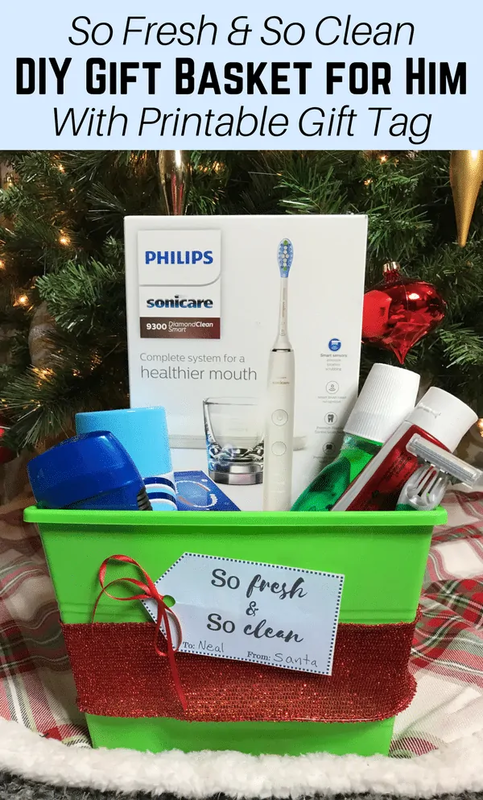 I kept the Philips Sonicare DiamondClean front and center, since it really was the most exciting item in the gift basket. Then, add a bow or tie a ribbon around the basket to add some holiday flair. 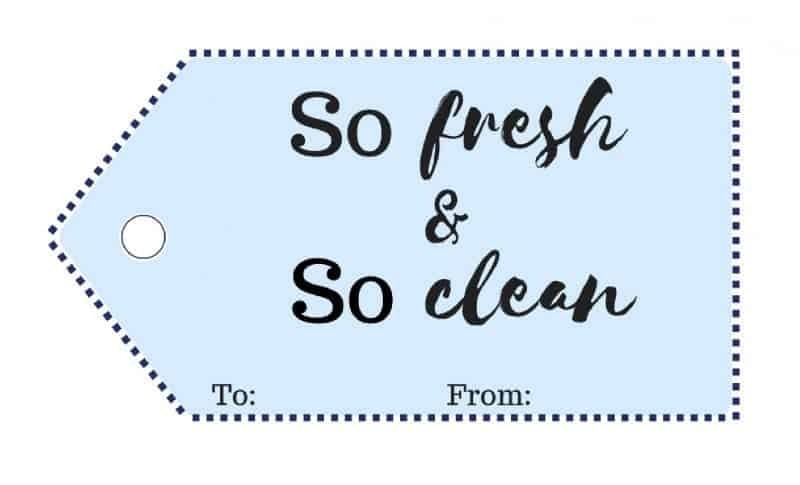 Next, click here to download and print out the “So Fresh and So Clean” gift tag. Then, fill it out with your name and your recipient's name. Use a ribbon to attach the gift tag. If will need to transport the gift basket, you should consider wrapping the entire basket in cellophane wrap, to keep everything in place. Since I was preparing the gift basket at home, and it was only to go underneath our tree, I was able to do without the cellophane wrap. That's it! Your “So Fresh and So Clean” basket is ready to gift! I hope that your recipient loves their gift basket and that you and your family have a very happy holiday! This is a great idea! Honestly, after nearly 15 years of marriage we are to the point where we want practical things so this is right up our alley! Nice ! I like this for my husband. My husband would love the sonic care toothbrush. 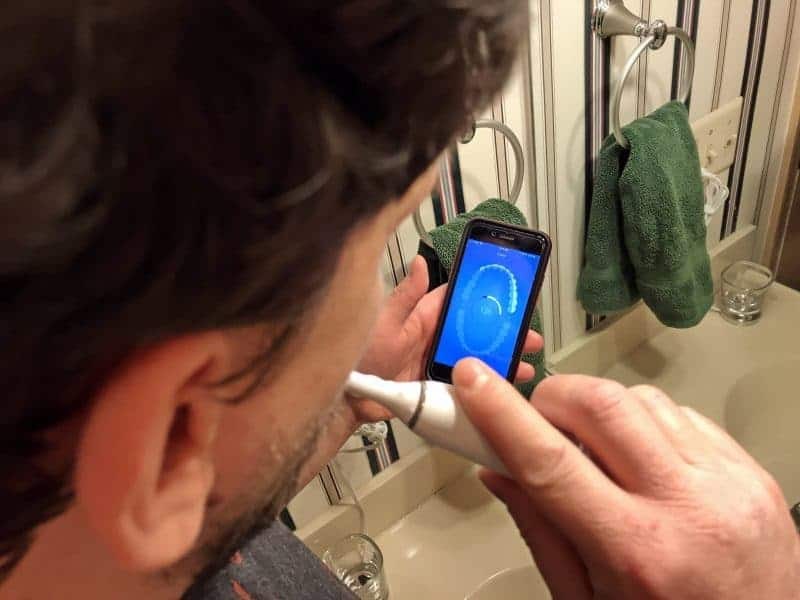 It’s so amazing to me that electric toothbrushes are now being connected with your smart phone! I love the idea of DIY giftbaskets for the people in my life. I need start doing them again.